You're probably familiar with things like belly bands and concealed carry shirts. But have you heard of leggings that can hide your firearms? They're sweeping the nation as more and more women discover that they can provide a comfortably fashionable look while also allowing the wearer to pack some serious heat. But are they truly worth it? Can they really protect you? Let's take a look at concealed carry leggings. The most critical component of concealed carry clothing is whether it will allow you to quickly reach your gun in the event of an emergency. Fortunately, leggings pass this test. They offer built-in holsters in the waistband that can cradle your gun against your body without compromising your ability to draw it in a hurry. Just make sure that you aren't covering it with tunic-style shirts that will impede your reach. Another important thing to consider about leggings is whether they have pockets for your everyday essentials like car keys. When it comes to concealed carry leggings, the answer is "some do, and some don't." Some of them will lack pockets to keep the silhouette streamlined and the firearm hidden; others will offer secret places to stash money and makeup in addition to your gun. 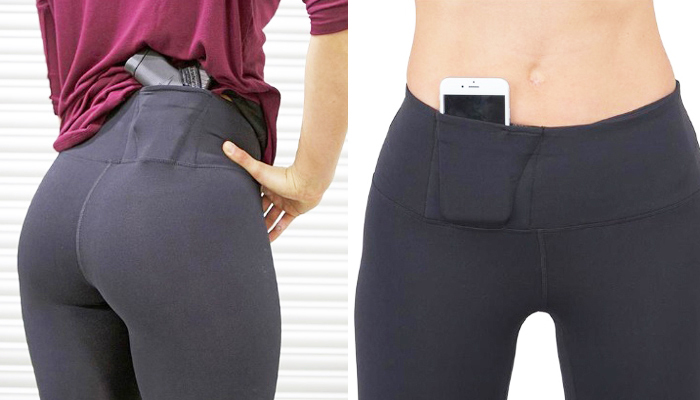 The ideal leggings are made of stretchy material, and this includes concealed carry leggings. You don't want to stand out from the crowd; people will start asking what else is different about your clothing, and the advantage of carrying a hidden weapon might be blown. Another benefit of stretchy leggings is that they'll cling to your waist and hold your holster nice and secure. You won't have to worry about it swinging around and giving away its position with its movement. These are just a few things that you should know about concealed carry leggings. They might not suit everyone, but considering all of their advantages, they're honestly some of the best clothes for concealed carry on the market today. Think about leggings the next time that you're looking for gun fashion!